The near-term mine reconnaissance system (NMRS) was an interim program developed to bring organic mine warfare capability to the Submarine Force before a long-term system (LMRS) could be completed. NMRS consisted of two torpedo-shaped, tethered unmanned underwater vehicles (UUVs) that launched and were retrieved through Los Angeles-class submarine torpedo tubes. The impetus for the NMRS program was a FY1994 Congressional mandate that identified covert mine reconnaissance capability in UUVs become a top priority. NMRS was created as a stopgap means of filling the mine reconnaissance role until a planned Long-Term Mine Reconnaissance System (LMRS) could be designed and implemented. 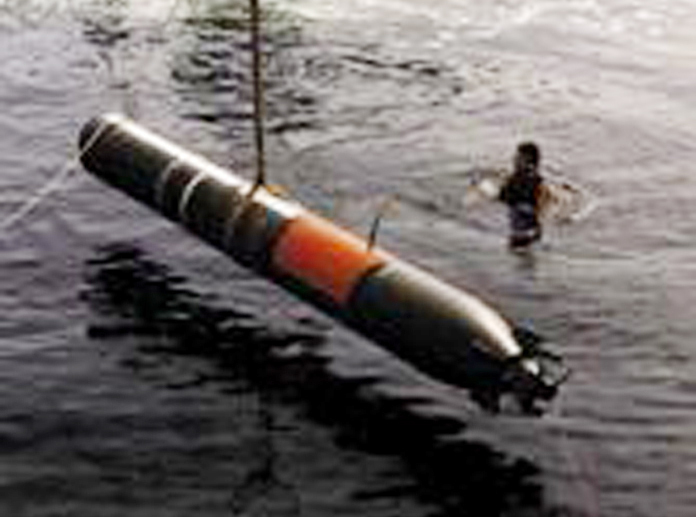 Specific missions envisioned for NMRS included remote surveillance in shallow to deep water, precise location and classification of mine-like objects in littoral and shallow-water environments, detection of gaps in minefields that could be exploited by covert and amphibious forces, and surveillance of coastal environments preceding an amphibious assault. In August 1994, Northup Grumman received a three-year development contract to design and build a prototype NMRS vehicle. Lockheed Martin worked with Northup Grumman to develop the platform’s control and propulsion systems. The resulting vehicle relied on multibeam active search sonar and a side scan classification sonar to carry out its mine reconnaissance missions. NMRS typically operated through a fiber optic link that allowed two-way communications; for littoral zone operations, however, it performed autonomously using batteries with a five-hour lifespan. The two NMRS prototypes began sea trials in March 1998 at the Dabob Bay Test Range in Keyport, Washington, overseen by the UUV Program Office and Northup Grumman. In June the system took part in the Joint Countermine Advanced Concept Technology Demonstration (JCM ACTD), a large-scale amphibious warfare exercise developed to showcase emerging shallow-water mine warfare technologies. After testing revealed navigation inaccuracies and a high false-alarm rate, the program was placed in lay-up in August 1999, although a single operational prototype was deployed aboard Los Angeles-class submarines during 2002 to provide interim mine reconnaissance capability ahead of LMRS initial operating capability, expected in September 2003. The NMRS program was terminated in May 2005; only the two NMRS prototypes were ever built. LMRS (later renamed AN/BLQ-11) was developed by Boeing Company and entered initial service in FY2003. In addition to being fully autonomous, LMRS boasted improved sensor, energy, and processing performance over the NMRS. Only two LMRS prototypes were built, however, because in 2004 the Navy consolidated the LMRS, Multi-Mission Reconfigurable UUV, and Advanced Development UUV programs into a single program.